Why Play at Sky Vegas Casino? 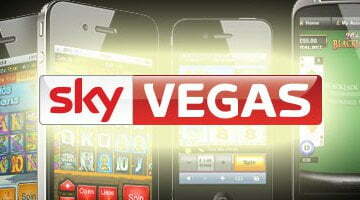 Sky Vegas is an easy-to-use mobile casino which bears a striking resemblance to the desktop client. The lobby is well laid out whether you’re on the instant-play or download app. And the ‘My Vegas’ tab lets you store favourite games, missions and tokens 24/7. Available on both mobile and online desktop platforms, Sky Vegas is offering new players a great welcome bonus worth £1000. On top of that, there’s a quibble-free £10 free bonus that doesn’t require a deposit. At time of writing, ‘The Strip Trip’ was the big promotion being run on Sky Vegas. Play games, earn tickets, and go for a top prize worth £1000 in cash every day. Players also earn 50% match bonuses as the promotion progresses. Sky Vegas Casino works off an instant-play website – accessed via the web browser – or a dedicated download app for iOS or Android. There’s little difference between the mobile and online clients, and games can be found pretty easily via the game tabs. There are over 120 mobile slots, provided by a range of great developers. There are also some games you won’t find anywhere else. Highlights include Blueprint’s King Kong Cash and Wild Antics, with Barcrest chipping in with some classics like Rainbow Riches. Most slots can be played for free without the need to log-in or register first. Progressives prop up the slots lobby, so games like Mega Jackpots Cleopatra and Plants vs Zombies are available at a decent range of stakes. Exclusive to Sky are titles like Football Frenzy, and instant-win arcade game with penalty shootouts, a pinball-style mini game and Golden Goals. Jackpots range from £25,000 to £250,000. Other Sky exclusives for tablets or smartphones include Sky Roulette and Sky Blackjack, as well as popular branded titles like Deal or No Deal Blackjack. The first thing to note at Sky Vegas Casino is that the site operates a Net Deposits rule. That means whatever method you use to deposit with MUST be used to withdraw with. It’s an added internal security measure, however, and shows how much Sky care about their customers’ safety. Real-money payments can be made by card or e-Wallet, with all major card suppliers accepted. There are no fees attached to deposits or withdrawals. If you love all things Sky, you’ll probably get a kick out of Sky Vegas. While better slots might be found at sister site, Sky Casino, there’s still plenty of exclusive action you can enjoy on the site. The offers are great as well, and it’s hard to find a better welcome bonus at a mobile casino these days.